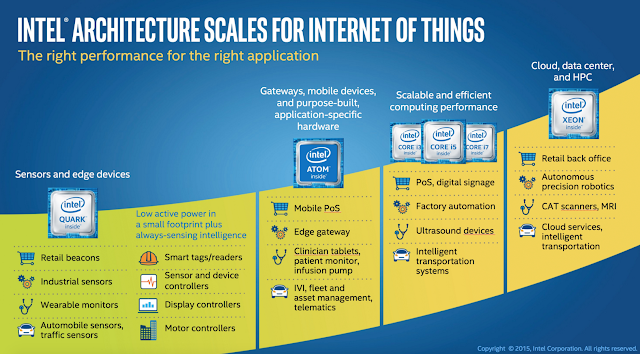 Intel introduced a new IoT Platform reference architecture and new hardware and software products or the Internet of Things (IoT) marketplace. The products include new Intel Quark processors for IoT, free and simple operating systems with a comprehensive cloud suite from Wind River. The company said it is focused on enabling the broad Intel ecosystem to simply develop, secure and integrate smart things. 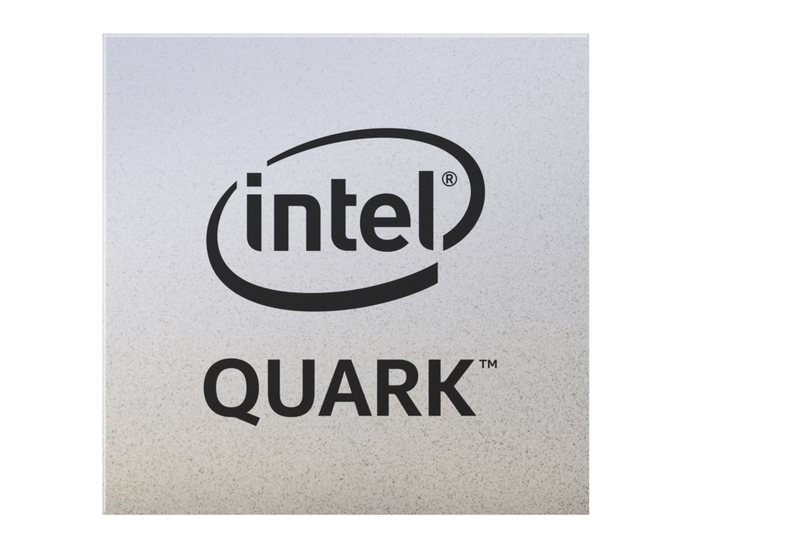 Intel said its new Quark SE SoC and the Intel Quark microcontroller D1000 and D2000 feature powerful processing in an energy-conscious envelope. The new products are in an ideal package for IoT, offering extended temperature for demanding environments and have long life reliability for peace of mind. The Intel Quark SE SoC for IoT offers an integrated sensor hub as well as pattern matching technology to deliver real-time insights from complex sensor data at the very edge of IoT. SAP is the first company to announce IoT solutions based on the new Intel IoT Platform and its SAP HANA Cloud Platform. Daily active users (DAUs) – DAUs were 1.01 billion on average for September 2015, an increase of 17% year-over-year. Mobile DAUs – Mobile DAUs were 894 million on average for September 2015, an increase of 27% year-over-year. 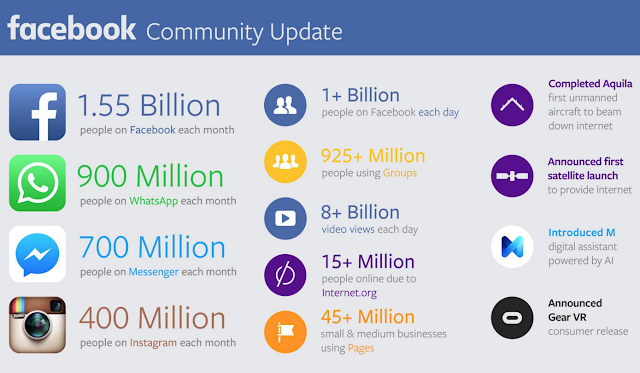 Monthly active users (MAUs) – MAUs were 1.55 billion as of September 30, 2015, an increase of 14% year-over-year. Mobile MAUs – Mobile MAUs were 1.39 billion as of September 30, 2015, an increase of 23% year-over-year. New devices and the proliferation of more-personalized and sophisticated digital services will lead to a massive increase in LTE Diameter signaling traffic, according to the recently published "Oracle Communications LTE Diameter Signaling Index, Fourth Edition." 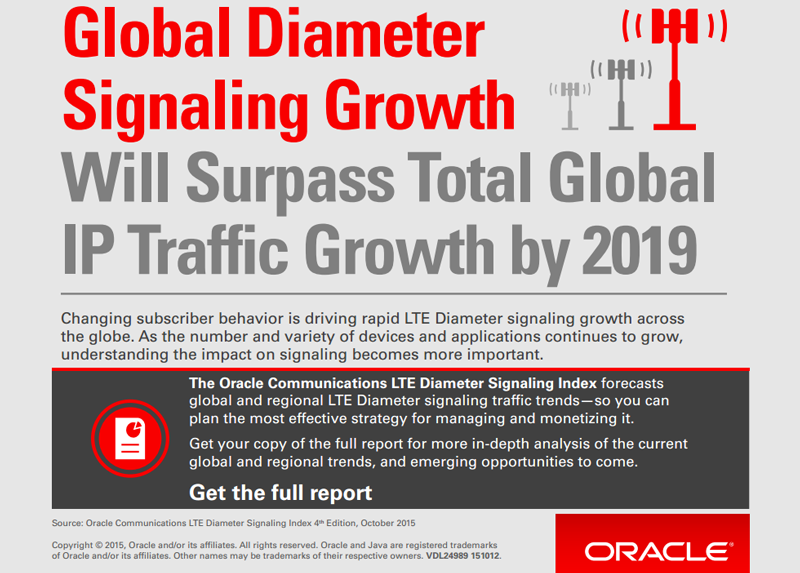 Oracle forecasts that LTE Diameter signaling traffic will grow at a compound annual growth rate (CAGR) of 68 percent in the next five years, from 30 million messages per second (MPS) in 2014 to 395 million MPS by 2019. An independent test report has found the Infinera-Arista joint data center interconnect (DCI) solution capable of operating at 100 GbE line-rate throughput with zero loss for any mix of traffic. 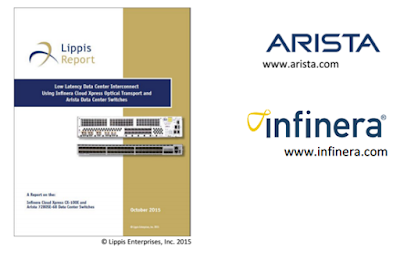 The Lippis Report, which provides independent testing of datacenter and enterprise networking solutions, issued the performance test report on the end-to-end DCI solution using Infinera’s Cloud Xpress optical DCI transport platform and Arista’s 7280 programmable switching platform. Qualcomm reported revenue of $5.5 billion for its fiscal fourth quarter, down 18% from the same period last year. Net income was $1.1B, down 44% from a year earlier. 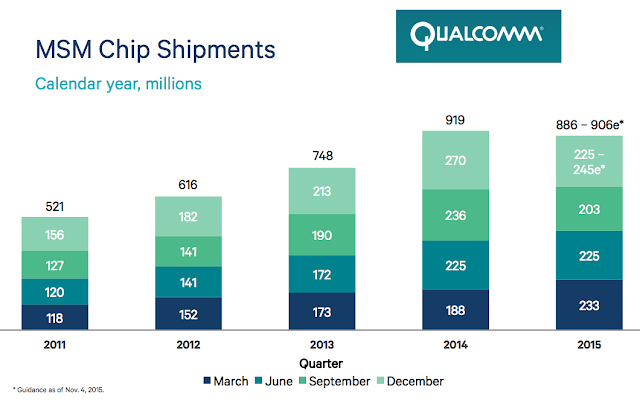 MSM shipments for quarter were 203 million, down 14% from 236 million in Q4 2014. A multi-vendor feasibility event testing pre-standard 25 Gbps Ethernet equipment and cabling has found an 86% interoperability success rate. 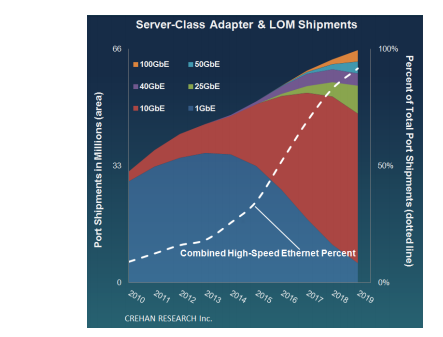 The recent 25 Gbps technical feasibility event held at the University of New Hampshire InterOperability Laboratory (UNH-IOL) produced promising results, according to The Ethernet Alliance, with a high percentage of tests exceeding expected requirements of the proposed IEEE 25 Gbps standard. Data captured during the testing was also provided to the IEEE P802.3by 25 Gbps Ethernet Task Force to aid in its refinement of IEEE’s proposed 25 Gigabit Ethernet (25GbE) specification. Vendors taking part in the testing included Amphenol, Arista Networks, Cisco, Dell, FCI, Hitachi, Intel, Ixia, Luxshare-ICT, Marvell Technology Group, Mellanox Technologies, Molex, QLogic, Spirent, TE Connectivity, and Xilinx. Amazon announced plans to open an AWS region in Korea in early 2016. This will be the fifth AWS region in the Asia Pacific area, bringing the global total to 12 (this does not include the regions that we are planning to open in India and Ohio, also in 2016). In addition to serving Korean customers, the new facility will allow organizations outside of Korea to reach end users in the area with very low latency. NTT Innovation Institute Inc. (NTT i3), the Silicon Valley-based innovation center for NTT Group, has appointed Nina Simosko as its new president and chief executive officer. She previously held the position of Chief Product Officer at NTT i3. Previous to NTT i3, Nina was responsible for leading the creation and execution of Nike Technology strategy, planning and operations world-wide. Prior to that, she was Senior Vice President of SAP's Global Premier Customer Network (PCN). "Nina's long-standing tenure in the enterprise software and services industry, combined with her unique approach to commercializing progressive and ground-breaking technology solutions has made her an invaluable asset to our organization," stated Hiroo Unoura, President, and CEO of NTT Group. "Our industry is rapidly evolving and the way in which our customers engage and experience technology is changing significantly. We're certain Nina will make immediate strides, meeting the challenges of a fast-paced and competitive market, to expand the reputation of NTT i3 as a premiere Silicon Valley-based innovation center." 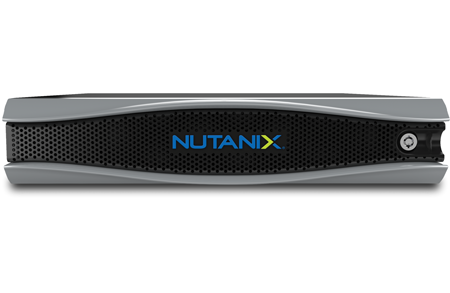 Lenovo will market and sell a new family of hyperconverged appliances powered by Nutanix software. 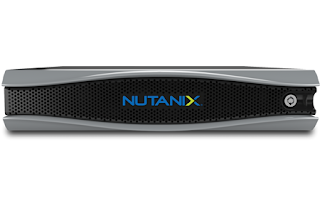 The two companies will introduce a new family of hyperconverged appliances built on Lenovo’s enterprise systems and powered by the award-winning Nutanix software. The joint solution, featuring several of the latest Intel technologies, will run nearly all workloads, including enterprise applications, databases, virtualized desktops, and big data analytics, with improved efficiency and scalability. Multi-system operators (MSOs) investing in carrier “Wi-Fi first” deployment strategies outside the home will enable them to compete with mobile network operators (MNOs) for customers — while also saving on mobile virtual network operator (MVNO) partnership arrangements, according to a new study commissioned by XCellAir, a start-up specializing in Wi-Fi Quality of Experience (QoE). XCellAir’s research shows that bringing the Wi-Fi quality of experience closer to that of cellular networks not only allows MSOs to capture new and retain existing customers “beyond the doorstep,” but will also yield a $4.5bn opportunity across the US market. This opportunity is comprised of $675m in revenue from additional services — better access to video services means better convergence of voice, mobile, broadband and video content, driving uptake of quad-play services and reducing churn. MSOs could also save $3.8bn in MVNO wholesale charges by moving more traffic onto MSO-owned and controlled Wi-Fi networks. “MSOs would like ‘cable cutting’ to be a fad that will fade as people get older and value convenience more, but this complacency is a huge risk to their business model,” said Narayan Menon, Founder and CTO, XCellAir. “By creating a Wi-Fi first service that goes beyond the home and matches cellular networks for quality of experience, MSOs have the opportunity to create a service that will underpin retention of their quad-play customers and will attract more. The analysis by Real Wireless and XCellAir is based on a study of 250 live Wi-Fi access points around its offices in Montreal, Canada, modelling common urban scenarios in which public Wi-Fi is in everyday use. The study revealed the underuse and inefficiencies of standard Wi-Fi technology, and where MSOs would otherwise need to focus efforts to create a carrier-grade network. The savings and opportunities available are based on MSOs with a 5% market share across the USA, over five years. Singapore's National Supercomputer Centre (NSCC) and its Agency for Science, Technology and Research (A*STAR) have deployed the Infinera Cloud Xpress to connect the two data centers in the bustling research campuses in Biopolis and Fusionopolis, Singapore. 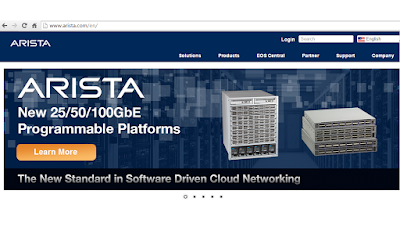 NSCC/A*STAR is the first publically announced customer using the new 100 Gigabit Ethernet version of the Cloud Xpress platform. The Cloud Xpress leverages Infinera’s unique photonic integrated circuit technology to support up to one terabit per second (Tbps) of input and output capacity in just two rack units. 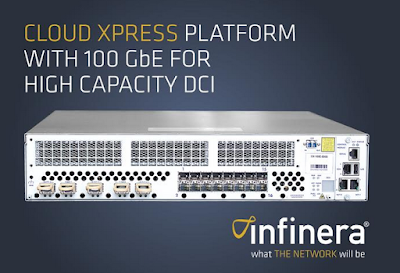 The Infinera Cloud Xpress delivers a full 500 Gbps super-channel of wavelength division multiplexing (WDM) line-side capacity on a single fiber without requiring external multiplexers or amplifiers. With the 100 GbE platform, the Cloud Xpress family includes three solutions, optimized for 10 GbE, 40 GbE and 100 GbE interfaces. FireEye reported Q3 revenue of $165.6 million, an increase of 45 percent from the third quarter of 2014. Billings were $210.6 million, an increase of 28 percent from the third quarter of 2014. GAAP net loss per share was $0.88, compared to a GAAP net loss per share of $0.83 in the third quarter of 2014. “We delivered a solid quarter of overall growth, with revenue up 45 percent and non-GAAP operating margins and earnings per share well ahead of our outlook,” said David DeWalt, FireEye chief executive officer and chairman of the board. “While we outperformed on many financial metrics, our billings performance did not meet the expectations we set in late July. The strength evident in our sales to new logo customers, our North American enterprise business and the Asia-Pacific region was partially offset by weakness in Europe. We believe this was due to a combination of macroeconomic factors, as well as the growing pains of a new organization. Additionally, the third quarter of 2014 included a large, five-year transaction that extended the average contract length to 34 months. This created a difficult year-over-year comparison and impacted our year-over-year billings growth rate as the average contract length declined to approximately 30 months in the third quarter of 2015,” added Berry.